5793 labyrinths found. Showing 3701-3720. Sorted by country, state, city, then zip/postal code. 40 miles south of Memphis, TN. GPS will accurately direct you to this location. Please call for availability of time/date you desire to visit. Labyrinth is adjacent to columbarium in a quiet space behind the church. Exit 81 off US Hwy 78. turn north, take first left, 3rd drive on left. Layrinth is on south side of house. 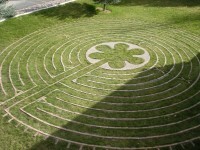 The labyrinth is in the Peace Garden. Situated on the corner of Alice St.and Lola St. Turn south onto Lola St, off HWY 12W, proceed to the top of the hill and turn right on Alice St. Enter through the gate and follow the path toward the Peace Pole, which is in the center of the labyrinth. Free and Open 24 hrs. Seasonal walks are held by special request for individuals or small groups. Ask to be added to my group list for notifications. On the corner of Winne Ave. and Tamarack, next to the Community Garden. Park in the church's lower lot. An original four-spiral design by Seattle artist Scott Ward, inspired by the United Church of Christ affirmation, "No matter who you are or where you are on life's journey, you are welcome here." Two entrance/exits symbolize radical welcome. In Sacajawea Park which is on the banks of the Yellowstone River. Take exit 126 off interstate 94, at exit 126 go 25 miles south, our house is on the right hand side. This labyrinth is built on top of a small butte that has a spectacular view for miles in all directions, there are trees surrounding it, mountains in the close distance and an endless supply of nature sounds and no city sounds. Peaceful and quiet. We offer other activities as well along with optional lodging. Located on Rock Creek 13 miles north of Red Lodge and 47 miles south of Billings, MT. 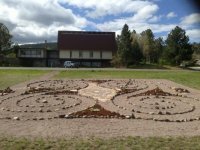 This labyrinth was designed and built by women but is open to all. 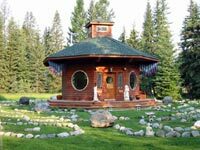 Built in a natural vortex clearing in the woods by the creek, the yin energy of water, earth and stone carries one quickly into deep center. Magic happens here. 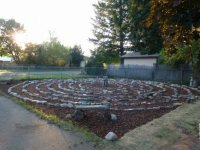 In addition all the energy of many earth-centered celebrations, ceremonies (including my own wedding) and Reiki attunements that have been held in the labyrinth add to its power. People who come for vision quests and retreats have private access to the labyrinth during their stay. Otherwise it is available for anyone to walk. Please call for an appointment. 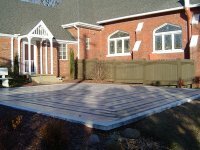 My husband Robert McTaggart and I are the owners of the labyrinth and property.